So if you are into crazy packaging, this is the item for you. It’s retailing for a whopping $95-however Sephora has it for $75 right now AND with free shipping. Hell yes. The item itself isn’t that spectacular as far as the contents go-it’s two pans: one has a highlighter, the other has a cheek/lip colour. So for the $75 that this now is, you aren’t getting a whole helluva lot of product. 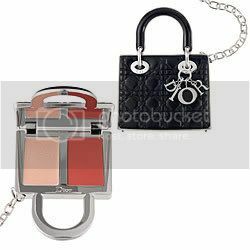 When you buy this item, you’re paying for the packaging-which is designed to look like a Lady Dior handbag, with “DIOR” charms, little handles, and the best part-cannage detailing.